"The kingdom of heaven is like treasure hidden in a field, which a man found and covered up. Then in his joy he goes and sells all that he has and buys that field." Jesus shared these two parables with his disciples while they were alone in a house. They are very similar with only slight differences. Jesus puts the two back to back in order to convey a greater emphasis on the meaning. As important as these two parables are, they are often misunderstood. I'm sure you have probably heard a sermon before telling you about how valuable God's kingdom is and that you should be willing to give up everything to attain it. Don't get me wrong, I totally agree with that message. God's kingdom is more precious than worldly wealth or any sin that you are holding onto. God's kingdom has everlasting value. If it cost you all that you have to purchase it, then you should pay that price. Yet there is two problems with that message. First, it is impossible for a person to give up everything for this kingdom. Don't be shocked by this. I have yet to see a person who is fully committed to God, without any selfish desires or any sin in their life. The second problem is that the passage isn't talking about what you need to give up in order to enter into the kingdom of heaven. Only when you read it in the light of works-righteousness do you get that impression. This is the difference between a works driven mentality and a grace driven mentality. Our old man loves to read this passage in a way that the burden is put on ourselves. But Jesus didn't come to give us a heavier burden, but to produce salvation where there is none. If Jesus was talking about selling all that you have and giving up everything to earn salvation, then He is putting onto you a very heavy burden indeed. Who can do this? Who do you know who has given all that he has? Who has denied every selfish desire or sinful thought? If this is our entry into God's kingdom, then I'm on the outs. I fail at this everyday and so do you. Yet there is one person who has done all this. Jesus is the one who gave up everything. Jesus is the one who denied all selfish desires in order to win back His lost sheep. Think about the first parable. Here we see a man who finds a great treasure in a field. He cannot claim this treasure until he purchases the field, so he hides the treasure. 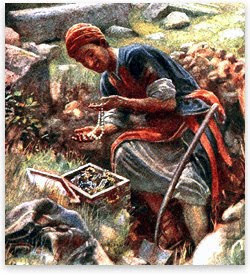 He then joyfully sells all he has to purchase the field and claim that treasure. This shows us the grace of God. Yes, selling all someone has is a great sacrifice, but Jesus does this with joy, because He knows that the treasure is worth it. 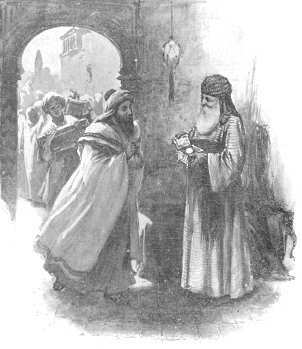 In the second parable, we see a merchant who seeks after a fine pearl. When he finds it, again, he sells all he has to pay the price for that pearl. The pearl is worth it to him. Jesus paid the ransom for your sins on the cross. He gave up everything to win you back. You were born as a slave to sin. Because of your sin, you are destined to face the wrath of God. Yet while you were still a sinner, Christ died for you. (Romans 5:7-9) He gladly gave up everything in order that you may enter into God's kingdom. Repent of your sins and doubt and believe this good news. Jesus is the man who found the treasure hidden in a field, and that treasure is you. You are that pearl of great value and Jesus gave up everything in order to purchase you. The kingdom of heaven is a gift to you, but it cost Jesus the highest price to purchase it. Put your faith in Him today!